Kevin DeYoung. 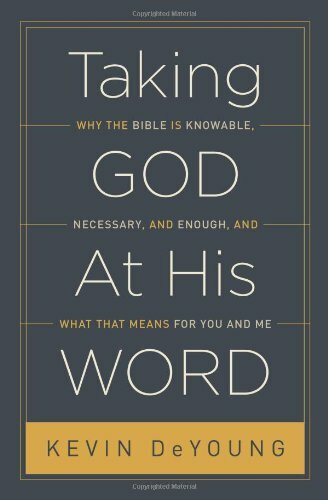 Taking God At His Word: Why the Bible Is Knowable, Necessary, and Enough, and What That Means for You and Me. Wheaton, Illinois: Crossway, 2014. 144 pp. $17.99. I loved all of Kevin DeYoung’s book, Taking God At His Word, but one paragraph was especially lovable. As I begin this review, I’ll start with it. The paragraph comes from the introduction. I had actually read a portion of the paragraph on a blog around a year ago when the book was first published. I loved it then, but now even more after seeing it in context, i.e. the context of DeYoung’s discussion of the longest chapter in the Bible—Psalm 119. Psalm 119 is an acrostic poem that gives one stanza to each letter of the Hebrew alphabet creating 176 verses. And what’s the topic of this Psalm? The Bible. Think of this chapter [the Introduction] as application and the remaining seven chapters of this book as the necessary building blocks so that the conclusions of Psalm 119 are warranted. Or, if I can use a more memorable metaphor, think of [chapters] 2 through 8 as seven different vials poured into a bubbling cauldron and this chapter as the catalytic result. Psalm 119 shows us what to believe about the word of God, what to feel about the word of God, and what to do with the word of God. That’s the application. That’s the chemical reaction produced in God’s people when we pour into our heads and hearts the sufficiency of Scripture, the authority of Scripture, the clarity of Scripture, and everything else we will encounter in the remaining seven chapters. There are several things in particular which stand out to me in this paragraph, but I’ll just mention two. First, I’ll start with my favorite line: “Psalm 119 is the explosion of praise made possible by an orthodox and evangelical doctrine of Scripture.” I love this anachronism because it’s not really an anachronism at all. We often (wrongly) think of our particular hermeneutical approach to Scripture as something we created, rather than the attempt to have the same hermeneutical approach to Scripture that Scripture has to itself. What I mean is this: I love that this quote reminds me that an “orthodox and evangelical doctrine of Scripture” is not something fabricated by moderns, but rather is the very view of the original authors. What a great reminder that when we, as evangelicals, put supreme confidence in Scripture, we are not putting more confidence in Scripture than the Psalmist had… or for that matter, more confidence than the apostle Peter had (see pg. 34)… or Jesus had (see pg. 110ff). 2. How Then Shall We Feel? In Taking God At His Word, I also appreciated DeYoung’s challenge that the Bible does not merely provide us with what we are “to believe” and “to do”—albeit very important things. DeYoung, both in the above paragraph and the rest of the chapters, also puts stress, as does the Bible, on how we are “to feel” about the Word. And it’s here that we find an often underrepresented emphasis in books about Scripture—but certainly not in Psalm 119. The author of Psalm 119 does not feel neutral about Scripture. He feels passionately about it. He loves God’s Word (vv. 48, 97, 119, 127, 140), he delights in God’s Word (vv. 14, 24, 70, 143, 174), and he longs to keep God’s Word (vv. 5, 10, 17, 20, 40, 131); he even expresses anger when people don’t (vv. 48, 97, 119, 127, 140). And the Psalmist urges us to feel this same passion. Before wrapping up my review, I want to give space to one of the book’s chief strengths. DeYoung has a wonderful, skillful way of articulating and then critiquing opposing views of the Bible—views which tend to bleed the Bible of its life giving power, rather than transfuse it to us. For example, although he avoids the technical name, he aptly engages the “documentary hypothesis” (104-5). Contra the evangelical view, the documentary hypothesis is the view that Moses did not write the Pentateuch to the Israelites while in the wilderness, with, of course, a few small editorial updates that came later (like the one about Moses’s death). Rather, the documentary hypothesis teaches that whole teams of people wrote these books over several centuries and often from divergent theological convictions. DeYoung notes, “This [complicated, cynical questioning of authorship] is part and parcel of what seems plain to so much modern scholarship, but it isn’t even remotely connected to anything we see from Jesus in the way he handled the Old Testament” (105). This sounds “nice, even noble,” but it smuggles in all sorts of false assumptions about the Bible. And besides, as DeYoung notes, the doctrines of the clarity of Scripture and Christian epistemology, are not only related to the Bible but our view of God. When we say that we believe the word of God is clear (with all the necessary nuances, of course), we are saying something about God, namely, that he is able to communicate with clarity. And when Christians say that we can actually know God through his Word (our epistemology), we are really saying something about God, namely, that God is able to make himself known through his Word. Throughout the rest of the book, DeYoung covers the four main, historical doctrines about the Word (it’s sufficiency, clarity, authority, and necessity), as well as fitting in a few other related chapters. And, in Taking God at His Word, he is. I highly recommend it.